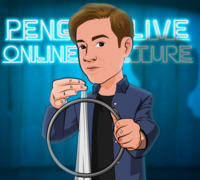 Today, when you order "Axel Adler LIVE", you'll instantly be emailed a Penguin Magic gift certificate. You can spend it on anything you like at Penguin, just like cash. Just complete your order as normal, and within seconds you'll get an email with your gift certificate. Axel Adler LIVE (Penguin LIVE) Innovative techniques and new moves to take classical conjuring to the next level. SUPPORT LIVE MAGIC. DOWNLOAD THE FULL LECTURE TODAY. Friction- A link and an unlink of two rubber bands. Fractal Ball Manipulation-A ball manipulation routine without shells or body loads. Ropin Hood- An exercise in target practice with a piece of rope. Knowing The Ropes- A multi-phased rope routine with new moves and sequences. Just one piece of rope and a pair of scissors. Oology- A Silk to Egg routine with an audience member. An updated version of "Things that go cluck in the night" by Tom Stone. Three of Cups-A minimalistic routine with the classic Cups and Balls. Self-bending Straw- A cute demonstration of telekinesis. 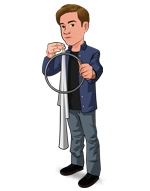 On Sunday, June 3rd, anytime after 12:00pm Eastern, click the MyPenguinMagic area at the top of the Penguin site. You'll see the "learn" button appear next to this lecture. 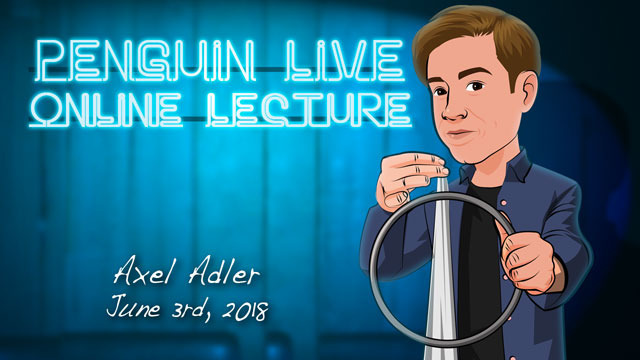 I was lucky to see the live taping of Axel Adler’s Penguin Lecture in person. Magicians you will want to buy this one! It featured an absolutely fantastic rope routine that Axel created for a competition act (which he won naturally). Also there was an interesting enhancement to Tom Stone’s “Things that Go Cluck in the Night” Silk to Egg routine (where both your egg & the spectator’s eggs turn into real eggs). Either of those routines are easily worth the purchase price of the lecture. But Axel also covered his cups & ball routine (which really only uses 3 balls) in great detail, as well as a beautiful billiard ball manipulation routine (that you too can do with only a decade of practice 😁), plus a very simple and slick looking linking rubber band idea, and a self-bending drinking straw idea. Go buy this lecture! I didn't get what I wanted, and there are only a few effects, but they were so well thought out. He elevates hard work into art. While under my current performance conditions, I cannot use most of his work or ideas... but his unlinking rubber bands handling did complete my current routine which is Melting Point by Cashaan Wallace, Raw Linkage by Eddie Marcus..and Now I can end With Axel's handling. Axel has an innocence about him but inside a shark of magic ability. He is a magician that inspired me to take it to the next level. What Axel gives you in this lecture is so well thought out. It is in perfect harmony and balance between mind and sleight of hand. On this video you can find esthetically pleasing and well constructed variations on some of our classics in magic. Axel Adler is one of my favorite creators in magic and his topological mind is just brilliant. Highly recommended. I recommend Axel Adler's lecture quite highly. His work is for workers--because he's a worker. His routines are not "pie-in-the-sky" ideas filled with breakable gimmicks and "smoke and mirrors." He performs (and shares) "classic" style effects cleanly and with a contemporary flair (such as a rope routine with his own twist, a billiard ball routine without any "you-know-what," and a very special cups and balls routine). Though he has "chops," as they say, he is not just a magician, he is a performance artist who understands how to use the stage and the significance of "movement" and blocking! Great lecture and some great thinking by Axel!